Jorn visited Paris for the first time in 1936, arriving on a motorcycle. He had got to know Kandinsky’s work through the review Linien in Copenhagen, and was disappointed to see that Kandinsky had neither pupils nor reputation in the French capital. He frequented Fernand Léger’s studio. In May 1937, he executed with Grekoff and Pierre Wemaëre, with whom he became close friends, a commission (received by Léger) for a large painting representing the Transport des forces for the Palais de Tokyo. He also assisted Le Corbusier for the decoration of the Pavillon des Temps Nouveaux at the Exposition Universelle. He returned to Denmark and remained in Copenhagen for the duration of the war. Between 1941 and 1944, he was the principal instigator of the review Helhesten (hell horse), writing a number of articles on archaeology and ethnology. This foreshadowed the Cobra movement and its review, for which he was one of the main driving forces. From 1945 he had wished to organise an international, experimental art group. He changed his name to Jorn. In 1946 Jorn returned to Paris. He made friends with Atlan at Saturday meetings in his studio in rue de la Grande Chaumière, where the Dane also met Noël Arnaud, Constant and Edouard Jaguer. Elusive, Jorn was constantly on the move, engaging in endless meetings and discussions around political ideas and commitments, as well as surrealism, in the apartments and studios in which Cobra conducted its many activities. Although, as is described elsewhere in this book, Cobra influenced a number of both French and foreign artists then living in Paris, the historic details of the movement exceed the scope of this work (see the catalogue of the exhibition Cobra, Musée d’Art Moderne de la Ville de Paris, 1982–1983, then shown at the Maison de la Culture de Chalon-sur-Saône and the Musée de Rennes in 1983). It is nonetheless important to recall that it was in Paris on 8 November 1948 that Jorn, Constant, Corneille, Appel and Joseph Noiret signed the declaration written by Dotremont titled La cause était entendue, considered as the founding act of Cobra. This meeting took place in the back room of the café-hotel Notre-Dame, on the corner of rue Saint-Jacques and quai Saint-Michel. The group was joined by a number of other Danish, Belgian (including Alechinsky) and Dutch artists, hence its logo ‘COBRA’ (Copenhagen, Brussels, Amsterdam). It dispersed in 1951, the year of the publication of the seventh and last issue of the review. A movement of revolt, which broke with everything that had gone before, it was based on primitivism linked to a repertory of forms representing a universal human core, with references to folklore and national myths, expressed through a popular plastic language with similarities to children’s drawings. A number of group exhibitions were held in Paris: Galerie Maeght, Les Mains Eblouies, or the Galerie Colette Allendy, in which various members of Cobra participated, notably Appel, Corneille, Dotremont, Constant and Alechinsky, and which prefigured their integration in what was at the time called the ‘École de Paris’. By a pendulum effect, these artists promoted the movement while also acquiring a personal reputation in the capital, before each pursuing their individual paths after 1951. As far as Jorn is concerned, we will only mention his stays in Paris. A multifaceted artist, he was also a writer, sociologist, architect and experimenter. His first exhibition was held in Paris in 1948 at the Galerie Breteau. The paintings showed large figures in thick impasto, as well as a strange mixture of complex forms, with small heads among anthropomorphic spirals. 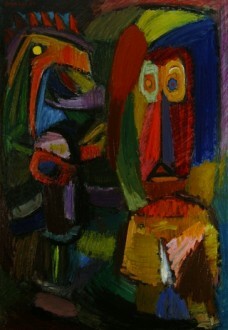 He painted confrontations in an energetic expressionist style that recalled both Picasso and Miró. Jorn later became a friend of Dubuffet. In 1951, Michel Ragon, who became the group’s French art critic, organised the first Cobra exhibition in Paris, at the ‘Librairie-galerie’ at number 73 boulevard Saint-Michel. The same year Ragon wrote the preface to the exhibition Cinq Peintres Cobra (Appel, Balej, Corneille, Jacobsen and Jorn). In 1961, again, he wrote a preface for the exhibition Cobra dix ans après, held at the Galerie Mathias Fels in Paris. This personal bestiary is sometimes identified with that of Scandinavian mythology (for instance his Aganask, a crocodile and beetle hybrid), and appeared in his book La roue de la fortune (translated from Danish by his wife Matie and Michel Ragon). Here we find the repertory of cults studied from Danish gold horns, with their myths that retain a permanent place in popular culture. Jorn lived only for his painting, with no concern for wealth or reputation. The art world’s indifference to his work, however, and the extreme poverty in which he lived for much of this period, forced him to leave Paris in 1953 for a Swiss sanatorium. Jorn subsequently lived between Paris, Switzerland and Albisola. Period of Modifications, collages composed from destroyed paintings. The Galerie Rive Gauche gave Jorn an exhibition, including 47 paintings, an illustrated catalogue with texts by Yvon Taillandier and René Bertelé and a poem by Jacques Prévert. These were angry works, executed with a wild brush that rapidly painted Jorn’s fantastic visions, excessive colours and images from a world in which everything is inversed: transformed landscapes change into people and back again into landscapes. Jorn was a ‘gestural’ painter before the official institution of Action Painting, painting in an explosion of pleasure. 1987 Retrospective. Lenbachlaus, Munich. Catalogue. Museums: Aalborg – Amsterdam – Brussels – Gothenburg – The Hague – Boston – New York – Pittsburgh – Stockholm. Guy Atkins: Catalogue raisonné peintures 1930–1973. Borgen, 5 vols. 1968–1986.